Acupuncture is a form of ancient Chinese medicine in which fine needles are inserted into the skin at specific points on the body in order to enhance the body’s production of its own healing chemicals and re balance energy levels. It is used with other physiotherapy treatments to ease pain and improve movement in a variety of conditions such as low back pain, neck pain, limb pain, osteoarthritis, headaches/migraines, and neurological conditions. 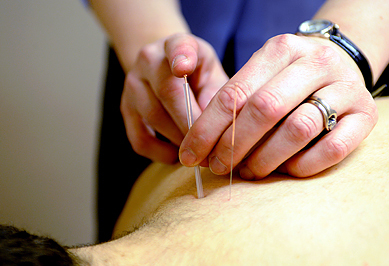 Acupuncture that is given as part of the physiotherapy treatment is covered by most insurance companies. It uses very fine sterile needles which are disposable. Currently, the National Institute for Health and Clinical Excellence (NICE) recommends acupuncture as a treatment option only for lower back pain. Read the NICE 2009 guidelines on low back pain (PDF, 980kb).